1. Heat olive oil in a large skillet and cook the onions, stirring, over medium heat until golden and soft, 3 to 4 minutes. 2. Add the spinach, one handful at a time, and toss to coat with the onions and oil. When all of spinach has been added and mixed, cover and let steam over low heat until the spinach is cooked down and wet in texture, about 10 minutes. until the excess liquid is cooked off, about 15 minutes. 4. Remove from heat. Drain any extra liquid and place the spinach in a medium-size bowl. Add pine nuts and mix well. Cool to room temperature (you can hasten cooling by placing the mixture in the refrigerator for 10 minutes). When the spinach has cooled, quickly mix the beaten egg into the spinach mixture. 5. Preheat the oven to 350° F.; Line two baking sheets or half sheets with parchment paper and set aside. 6. Unroll the fila pastry dough onto a large cutting board and gently smooth out with dry hands. With a kitchen scissors or very sharp knife, cut the fila in half widthwise, along the short end. Re-roll one half and securely wrap in a plastic bag, plastic wrap, or aluminum foil (fila will keep up to 1 week in refrigerator, but do not refreeze). Cut the other half lengthwise into 3 equal strips 3 inches wide and about 12 inches long. Place the strips on top of each other to form one stack and cover with a slightly damp kitchen towel to keep the fila from drying out and crumbling. You may freeze the triangles at this point layered between pieces of parchment or wax paper in a large air-tight container or tin wrapped with aluminum foil or plastic wrap. When ready to bake, spread the frozen triangles out onto 1 or 2 baking sheets and bake immediately without thawing until they become slightly brown on the outside and soft and fully cooked on the inside. Will keep in the freezer for up to 4 weeks. 10. Bake the finished triangles until slightly brown, about 15 minutes. Place on a large platter and serve warm or at room temperature. Several years ago I was invited down to a Passover demo at Kehila Kedosha Janina, a Romaniote synagogue (built in 1927 by Jews from Janina, Greece) on Manhattan’s Lower East Side. I was warmly greeted by Marcia Haddad Ikonomopoulos (the synagogue’s museum director) who introduced me to the community. 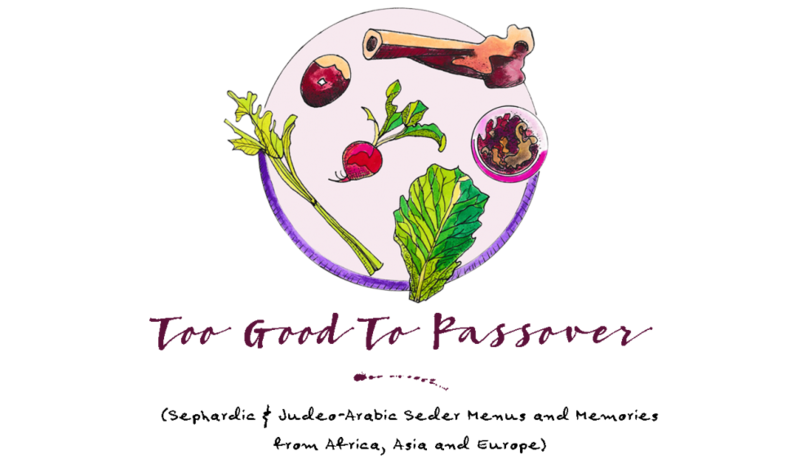 I was touched by how welcoming the members were, and through this event I gathered many contacts (who I later interviewed) for my Passover cookbook research. 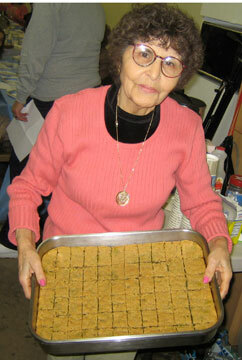 Below is a recipe that was demonstrated by Koula, and adapted by me later on. It is not only delicious, but a dish that is great to serve with either a meat or dairy meal because it is parve. 1. Heat the oil in a large skillet over high heat for 1 minute. Add the chopped onions and mix well. Cook until soft and transparent, about 10 minutes. 2. Add the defrosted spinach leaves and mix well to coat with the oil and onions. Cover with a lid and cook, over medium heat, until the spinach becomes very soft and the water has cooked off or been absorbed, about 30 minutes. 3. Throw in the chopped dill, parsley, salt, and pepper and mix well, and remove from heat. Pour spinach mixture into a large mixing bowl and cool until slightly warm or to room temperature. 4. Mix in the beaten eggs and matzah meal. Set aside to prepare the dough. 5. Preheat oven to 375 degrees F.; Grease a 9-inch square baking pan with oil. a smooth ball. Divide dough into two even balls. 7. Using your fingers and the palms of your hands, flatten one ball of dough evenly along the bottom f the pan, making sure to reach all of the corners (do not press dough up along the sides).